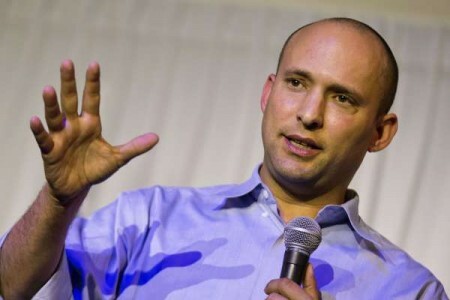 Diaspora Affairs Minister Naftali Bennett sent a letter last week to rabbis of the Reform and Conservative movements in North America pledging to improve ties between Israel and the Diaspora. The letter came against the background of ongoing tensions surrounding non- Orthodox prayer at the Western Wall. Bennett wrote that a newly constructed prayer platform at the southern end of the Western Wall for non-Orthodox services could serve as a stepping-stone to reinvigorate Israeli-Diaspora ties. “I view this as an opportunity to open a new page in the Israeli-Diaspora relationship and I call on you to join me as we work to settle our differences, put them behind us and move forward as a single and unified people,” the minister wrote in a missive that will be delivered to Reform and Conservative rabbis in North America via their Israeli counterparts. Observing criticism of the prayer space, which is located in the Robinson’s Arch area south of the main plaza, Bennett acknowledged that “it is not perfect” but said he wished to provide an immediate, albeit temporary, solution for the non- Orthodox prayer at the Western Wall during the High Holy Days. He expressed support for the “Sharansky Plan,” a set of proposals drafted by the Jewish Agency chairman, Natan Sharansky, that was hailed by the Reform and Conservative movements as a breakthrough in their demands for equal prayer rights at the Western Wall. The Women of the Wall prayer rights group denounced the newly constructed prayer platform earlier this week as being inconsistent with the proposals made by Sharansky and accused Bennett of seeking to distance the group from the main plaza. And Bennett said when announcing the prayer space that his intention was to have the current plaza as it is currently known officially recognized as a place solely for Orthodox prayer. This would run counter to an April ruling by the Jerusalem District Court which reinterpreted existing laws to allow the members of Women of the Wall for the first time in its 25-year history to legally wear prayer shawls, tefillin and practice any other Jewish custom freely at the main Western Wall prayer area. Separately, a government committee headed by cabinet secretary Avichai Mandelblit is expected to deliver its recommendations for the site in the coming weeks, although it is believed that they will not be as far-reaching as Sharansky’s plan. “What happened to the Jewish Temple 2,000 years ago serves as a warning for us today. Institutions of the Conservative Movement issued the following joint statement: “The United Synagogue of Conservative Judaism, the Rabbinical Assembly and the Masorti movement in Israel received the letter from Minister Naftali Bennett with great encouragement and appreciation. We share Minister Bennett’s feelings and hope that this new year will be a year in which we turn the page on the relationship between the Diaspora and Israel, as well as between Jews with different views in Israel, on matters of such crucial importance to all of us, particularly the freedom of all to express their Judaism according to their own conscience. In response, the Conservative movement expressed its appreciation for Bennett’s letter, saying it was very encouraging. “We share Minister Bennett’s feelings and hope that this new year will be a year in which we turn the page on the relationship between the Diaspora and Israel, as well as between Jews with different views in Israel, on matters of such crucial importance to all of us, particularly the freedom of all to express their Judaism according to their own conscience,” the Rabbinical Assembly, the United Synagogue of Conservative Judaism and the Masorti movement in Israel wrote in a joint response to Bennett.